Maj. 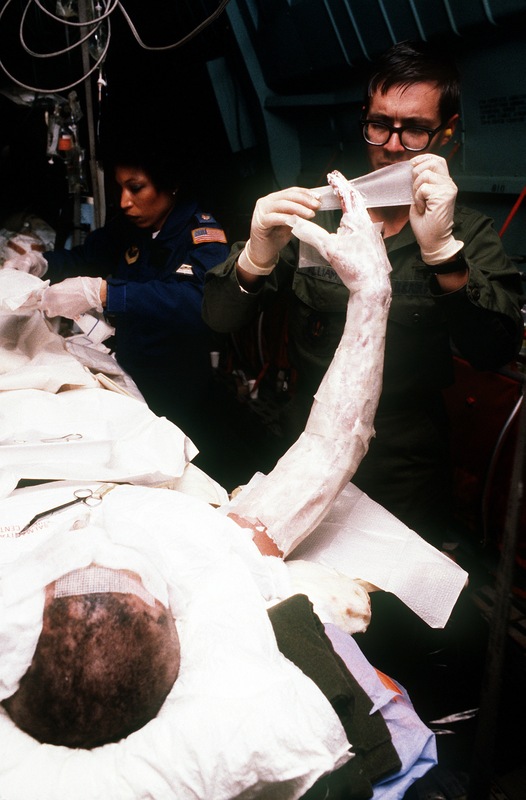 Beard, a member of the 2nd Aeromedical Evacuation Squadron, and Maj Gilliam, a member of the Wiesbaden Hospital staff, change dressings for Petty Officer 3rd Class David Burbine. The sailor, who is being transported to Germany aboard a 438th Military Airlift Win g C-141B Starlifter aircraft for further treatment, was one of four crewm en who were seriously injured when the guided missile frigate USS SAMUEL B. ROBERTS (FFG-58) struck a mine while operating in the Persian Gulf.